Kill The Boss To Attain Self-Organization! Here is an honest look into why self-organization is a buzzword now. We will quickly try to find answers to certain puzzling questions such as: Why is self-organization so important? Why are companies shifting gears now? Is something terribly wrong with the normal top-down organizations? Why Hierarchy Should Give Way to Self-Organization? Hierarchy, the conventional way to structure an organization, has, of course, helped companies achieve great success (here we go with the popular perception of success: having good turnover and brand name). After reaching the pinnacle of success in this stream, companies start concentrating on moving towards as an employee-beneficial organization. Experience shows that success after a point greatly depends on the type of people you carry forward. As an organization, you might grow in number. But it’s good to contemplate how many of your old timers are still around? Your brand would be well known. But, have you given serious thought to whether your employees are your brand ambassadors? Organizations, slowly, are realizing the need for self-driven people to move forward in big leaps. Hierarchy-driven success is highly toxic and risky. You knock down the leader, you have a group of headless chickens. So, Where Do We Start To Achieve This? The move starts with the boss. Leaders, managers, mentors, if you fall into the category of leading a team, a shift in your mindset gets the ball rolling. Years of being on the higher rungs of hierarchy would groom our minds to always have our ideas/suggestions/orders carried out without much opposition. Self-organization would remove you from the power pedestal and instead will add you as one among the team. Good dynamics within your team will help when you need certain decisions taken, based on your experience. So, What Does An Organization Stand To Gain With This Shift? This shift indeed can be hugely beneficial to your organization. Our experience is great proof! a. Improved Customer experience – People are proactive thinking along with the customers on their business structure, rather than just the snippet of code they handle. They communicate to the point, setting the right expectations. b. Improved employee happiness score – As employee involvement is higher in all organizational affairs, they will feel higher self-actualization and hence greater level of contentment. c.	Increased employee referrals for hiring – As employees are happy to stay here, they will be enthusiastic to refer their talented friends to join their organization. Hence, increased employee referrals. d.	Solutions along with complaints – People are focussed on bringing about positive changes to their organization. Therefore, they will think about solutions along with complaining. e.	Good Retention rates – This is a natural outcome of higher employee happiness score. People would love to stay with you for a longer time period. Let’s take a look at the values that a self-organized team would ideally possess. Openness – The perception is different in different cultures. An organization would benefit here with a lot of constructive feedback, which otherwise is suppressed in a hierarchy-driven environment. To build this culture, open remarks need to be rewarded and never criticized. Entrepreneurship – Entrepreneurs are self-starters. They wait for no validation. They take risks and have the mindset to learn from failures. But no one is born with this trait. One’s atmosphere, in this case, work atmosphere, can help in instilling the confidence to try out new ideas. You need people who come to you with alternatives/solutions to issues, and not just complaints. Trust – Your people would need to trust you and each other. When decisions are taken without a bias, taking in everyone’s suggestions, you slowly gain this important value in your organization. A huge part of this is gained when it comes to handling non-performance issues among team members. A set process is to fire, but instead, the best option is to gauge their strength areas and shift their responsibilities. The journey to self-organization is rocky. This shift is painful, it takes time, and I am still on this journey. You will go through phases where you are forced to rethink. Disruptions are meant to happen, and when they do, you know you are on the right path. Eventually, you will be surrounded by happy energetic people who love the company and who grow along with it! Lekha Philip is the Chief Operating Officer at Bridge - Global, Member of the agile community with scrum certifications - CSM & CSPO. She is having over 10 years of experience in the service industry, working with client relationships, process management & team building. 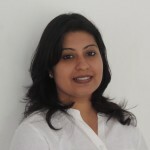 Lekha is responsible for the operations in Bridge India and client co-operation in India and Europe.